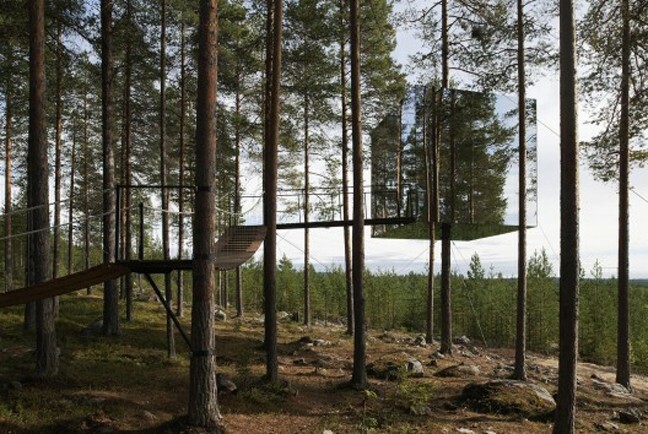 This is one of the strangest hotel rooms in the world – an invisible treehouse. Located in a beautiful forest just south of the Arctic Circle this tree hotel is an incredible engineering marvel because to get this weird hotel to float in the forest the engineers had to first get the trees to talk to each other. Really. If you go down into these woods today…… you can be sure of a big surprise. 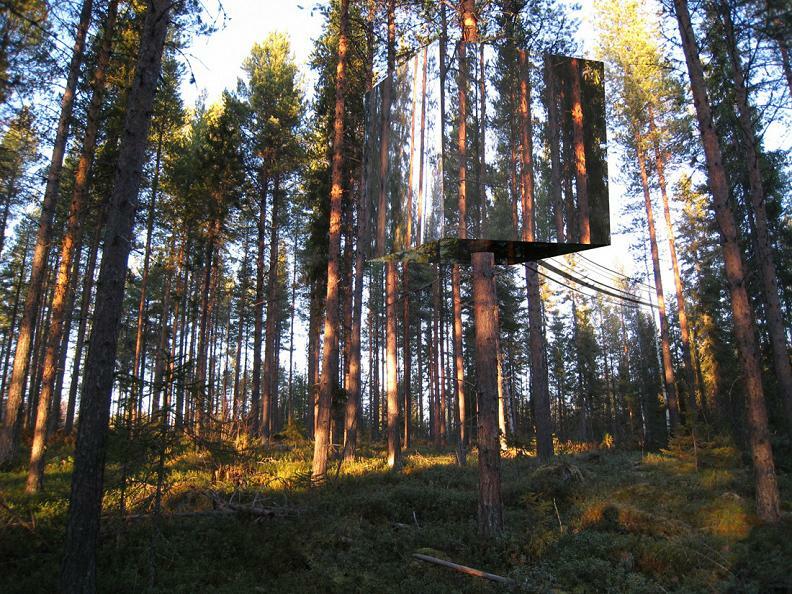 “We call it invisible house because sometimes when you come you cannot really see it because it looks the same as the forest” says invisible tree house owner Kent Lindvall. For $400 a night at the tree hotel, you get a double bedroom – an eating area – and a bathroom. The 15ft high, 13ft wide structure suspended cube is the boyhood dream of Lindvall. “When I was young, I built my own treehouses and I can have a feeling of freedom to sit up in the tree and look down on the other people”. So Kent got thinking – maybe everyone else would like to be a kid up a tree again. He called a team of brilliant architects and gave them a nice grown-up challenge to design a modern tree house with sustainable luxury and at one with nature. They came back with the two-way mirrored glass cube. The mirrored glass means you can look out in but no-one can look back in. 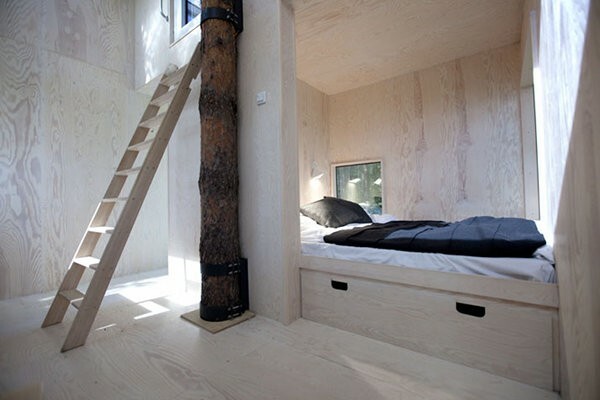 But what’s amazing is that this whole 7 tonne structure, is supported by a single living pine tree, just 10 inches wide. That’s all down to some clever engineering. The hotel was built in two halves, then lifted into position with cranes on either side of the tree. To give it the impression that it’s just floating in the forest, it’s held in place by some stabilizing, almost invisible wires, and a series of tree friendly metal rings. “When the tree grows, we can open it… so we don’t kill the tree,” says Lindvall. “It looks like they are still very green in the top and look very fresh so I think it’s not a problem for them”. Scotch pines are very sturdy trees, but no one had ever attempted to build anything like this before. So Kent sought the advice of some experts at the local university who suggested a weird and strange way he might strengthen his supporting tree – by first getting the trees to talk to each other! “It sounds crazy and until a few decades a ago people would have said you were crazy,” says Dan Metcalfe of the Swedish University of Agricultural Sciences, “but there’s increasing research showing now that there are quite advanced levels of signaling, even communication between plants. If one tree gets damaged, the other trees can in some way feel it or get connection with that. When pine trees are chopped down their stumps are believed to send out a chemical aroma as a signal to other nearby trees, to strengthen themselves against attack. So Kent tried chopping down the trees near the hotel he was planning, and lo and behold his pine tree produced extra sap, to strengthen itself. “If you want to make a tree hotel you must make sure that it works because you take in guests and after two years there’s been storms, rain, snow and it still work really good,” says Kent. If you don’t think a night at the Tree Hotel can ensure you sleep like a log, then you could try getting 40 winks at Kent’s other tree houses – like the Bird’s Nest…. ….or the UFO with its very own close encounters-style retracting staircase.